Why don’t you drag out the bullies instead? The scenes of police forcibly dragging out activists from the Planning Authority’s offices is a stark reminder of the way ‘democracy’ turns its guns on the wrong target in this peculiar country of ours. The activists’ only crime was that they bothered to protest against the long-delayed fuel station policy as much of this precious little land around us continues being gobbled up by speculators. Oh… and they beat their drums as they relayed their message through their megaphones, not exactly a crime in my books, especially since a couple of those protesting are among the best musicians this country has to offer. I have no doubt that many people behind their screens applauded as they saw Rapid Intervention Officers (not district officers I'm informed) manhandle the activists, who offered nothing more than passive resistance. This is, after all, a country where our idea of activism is to start a petition on Facebook. 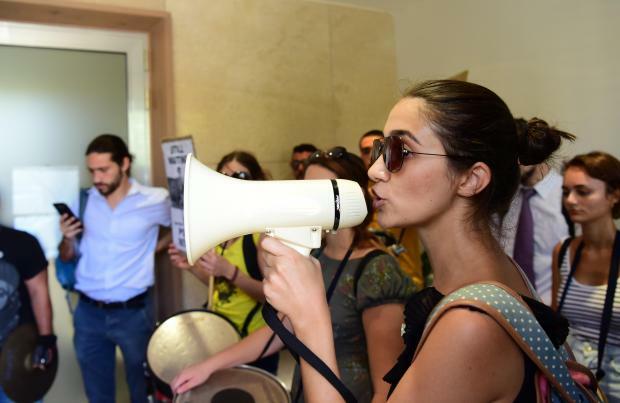 Many others shudder at the thought of activism, lest it risks "shaming" the name of Malta. I will not delve into the fact that this protest was actually nothing out of the norm - thousands of such protests are being held all over the world as we speak because, you know, that's what happens in democratic countries. What upsets me, and thousands of law-abiding citizens, is that the same RIU officers should be flexing their muscles when contractors and their henchmen threaten their neighbours, they would not dare adopt the same heavy-handed tactics when yet another brawl breaks out at the festa/każin/on the road... they would never dare act the same way at any political meeting. These activists merely turned up at the authority offices because their legitimate environmental concerns have been ignored and can't take the fact we're all being taken for a ride at the altar of money. All of us should be marching to the beat of their drum.